Jingle, jingle, jingle! Here comes the second Christmas pattern of the season, a cute little penguin to decorate your tree. Like the snowman crochet pattern, it is very easy to make, perfect for beginners. Cut a piece of white felt in the shape shown below, and glue it to the front of the body. Fasten off, and leave a long tail for sewing. Do not stuff them, they will remain flat. Sew the wings on each side of the body with a thread needle. Weave in loose ends. Glue some goggly eyes on the face of the penguin. Cut a piece of orange felt in the shape of a triangle and glue it under the eyes. Cut two pieces of orange felt in the shapes of bird feet and glue them under the body. Fasten off, and weave in the loose end in the stitches of the hat. Glue the pompom to the top of the hat. Pour some glue around the inside edge of the hat, and glue it to the head. Make a bow with a small size ribbon, and glue it in front of the penguin, underneath the beak. Cut a piece of embroidery thread and insert it in the stitches of the hat, behind the pom-pom, Make a secure double knot, then hide the knot inside the hat. Voila! I hope you enjoyed this pattern, and if you have any questions, don’t hesitate to ask me in the comments. I will make sure to answer your replies as fast as I can. Next weel I will publish a pattern to make a little Santa ornament to add to your collection. It’s time to start some Christmas projects. This year I am going to publish several patterns to make ornaments. The first one is a snowman that will look really cute on your Christmas tree. Get your hooks and yarn ready! I used Caron Simply Soft to make the snowman, and a 2.75mm hook. The larger the hook, the bigger it will be. This one is about 4 inch tall, and it is crocheted in spirals without joining the rounds. I hope you will enjoy this pattern! Fasten off, weave in the loose thread in the stitches of the hat. *Each stitch has two loops. Insert your hook on the back one instead of both loops when you work on row 5 (BLO). *Row 9 is worked with the front loops only (FLO). With red yarn, 40 in ch. – Glue the head and body together. Glue the goggly eyes on the head. – Cut a rectangle in some orange felt, about 1 x 0.5 inch . Roll it and glue as you go. Glue between the eyes to make a nose. – Cut 2 circles in some green felt, and glue to the front of the body to make little buttons. – Put a line of glue around the inner edge of the hat, and set on the head. – Wrap the scarf around the neck and make a single knot. – Cut some black embroidery thread to make a hook, and insert it in the stitches on top of the hat. Make a secure double knot, then hide the knot inside the hat. Voila! your little snowman is done. I hope you enjoyed this pattern, and if you have any questions don’t hesitate to ask me in the comments section. I am still making Christmas ornaments, and yesterday I came up with a cute pattern to make Santa stockings to hang on tree. This pattern is easy to follow, I hope you enjoy it! You will need some red and white yarn (I used Red Heart Super Saver), some white embroidery thread, a needle and a small red ribbon. 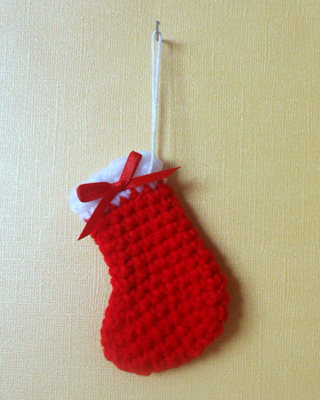 I used a 2.75mm hook to make this stocking, the finished size is about 3 inch long. Fasten off, and weave in loose end. 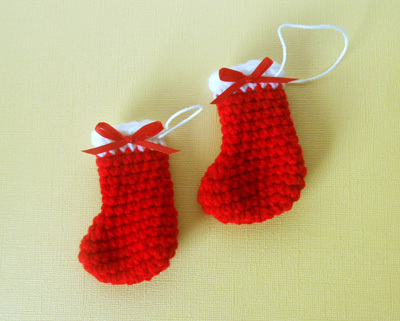 Glue a little red ribbon on the side, and insert some white embroidery thread at the top of the stocking to make a hook. I hope you enjoyed this pattern, and if you have any questions don’t hesitate to ask me. Happy crocheting!